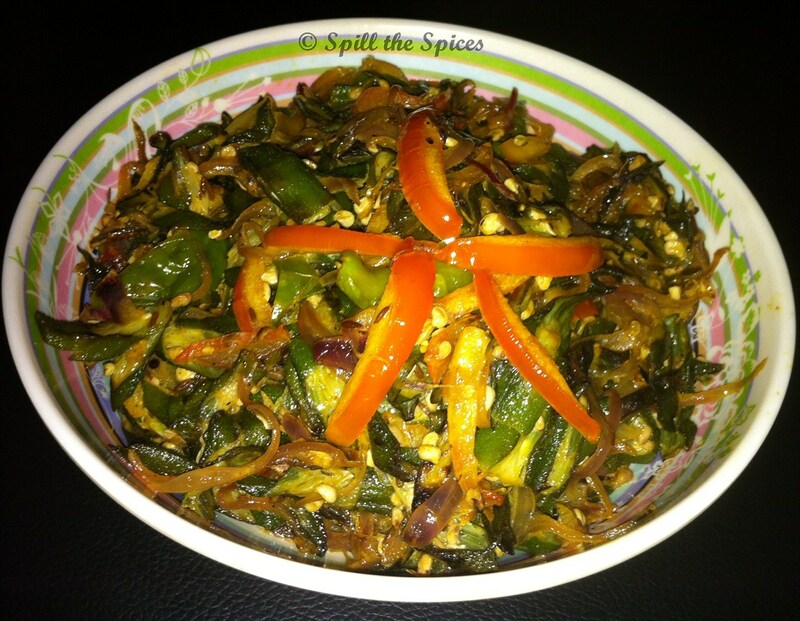 Bhindi Do Pyaza or Okra Onion Stir-Fry is okra sauteed with double quantity of onions. Fried bhindi is combined with lots of onion which gives a sweet taste to the dish and addition of curd gives a tangy flavor. 1. Wash the bhindi. Dry it fully with a kitchen towel. Trim the ends and cut them into elongated diagonal pieces or 1 inch pieces. 2. Heat 2 tbsp oil in a pan. Fry the bhindi in high flame, stirring gently to reduce the sliminess of bhindi. Once the sliminess has reduced, fry in low flame till the bhindi is cooked. Keep aside. 3. In same pan, heat 1 tbsp oil and add jeera. When it pops, add sliced onions. When onions turn translucent, add ginger-garlic paste, green chillies and little salt. Fry till the onions turn golden. 4. Add sliced tomato, turmeric powder, red chilly powder, garam masala, amchur powder and stir well. Fry for 4-6 minutes. 5. Add the fried bhindi and adjust salt. Combine well and fry for 4-5 minutes. Now add the whisked curd and fry till the curd dries up.